This has been an amazing week for me. On the personal side of things my ship is sailing in the right direction. It’s amazing what the new year can do to clarify values and vision. Getting to the specifics of why I’m calling this post “Synergy through Action.” That’s the best way for me to describe how my participation in this week’s Tableau and data visualization community offerings have influenced me. It all actually started on Saturday. I woke up and spent the morning working on a VizforSocialGood project, specifically a map to represent the multiple locations connected to the February 2017 Women in Data Science conference. I’d been called out on Twitter (thanks Chloe) and felt compelled to participate. The kick of passion I received after submitting my viz propelled me into the right mind space to tackle 2 papers toward my MBA. Things continued to hold steady on Sunday where I took on the #MakeoverMonday task of Donald Trump’s tweets. I have to imagine that the joy from accomplishment was the huge motivator here. Otherwise I can easily imagine myself hitting a wall. Or perhaps it gets easier as time goes on? Who knows, but I finished that viz feeling really great about where the week was headed. Monday – Alberto Cairo and Heather Krause’s MOOC was finally open! Thankfully I had the day off to soak it all in. This kept my brain churning. And by Wednesday I was ready for a workout! So now that I’ve described my week – what’s the synergy in action part? Well I took all the thoughts from the social good project, workout Wednesday, and the sage wisdom from the MOOC this week to hit on something much closer to home. I wound up creating a visualization (in the vein of) the #WorkoutWednesday redo offered up. What’s it of? 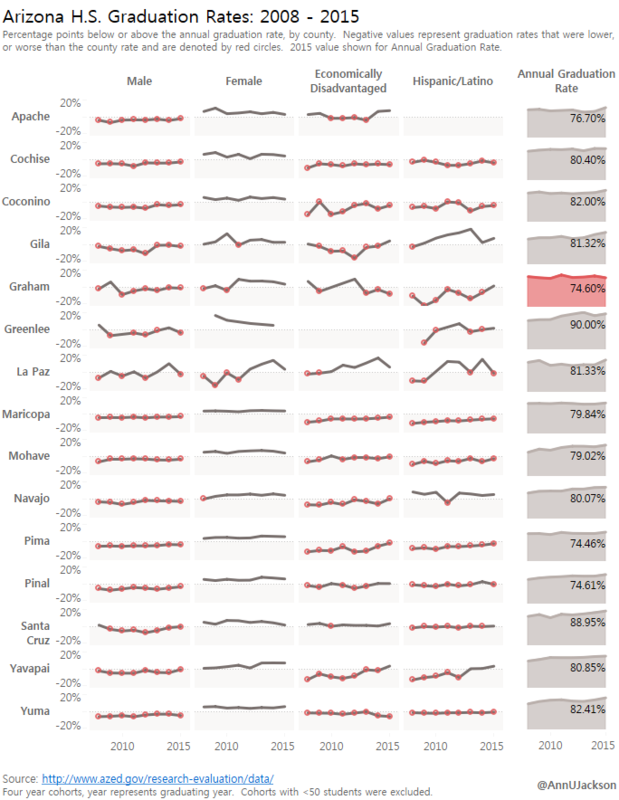 Graduation rates of specific demographics for every county in Arizona for the past 10ish years. Stylized into small multiples using at smattering of slick tricks I was required to use to complete the workout. Here’s the viz – although admittedly it is designed more as a static view (not quite an infographic). And to sum it all up: this could be the start of yet another spectacular thing. Bringing my passion to the local community that I live in – but more on a widespread level (in the words of Dan Murray, user groups are for “Tableau zealots”).